Special thanks to Communications Network member Stefan Lanfer, knowledge officer at the Barr Foundation, for sharing a story about how the Conservation Law Foundation (CLF) had an unprecedented success in disseminating findings from a report about sustainable agriculture in Massachusetts. As Lanfer notes in his post on the foundation’s website, CLF “created a simple, elegant infographic that distilled the report’s key findings. And they put that out in front of their communications. The results? For one, a 7,000 percent increase” in the numbers reached through social media. Lanfer asked Ben Carmichael, CLF’s senior communications manager, to write about what his group learned from this experience. We’re pleased to repost Carmichael’s comments here. 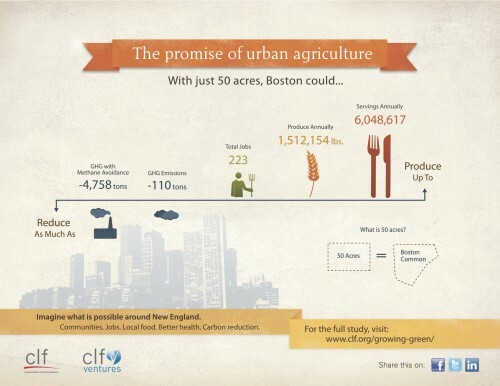 Following months of research we at CLF and CLF Ventures were ready to release a report showing the huge potential for sustainable urban agriculture in Boston. The economic and environmental possibilities by converting just 50 acres are significant. And yet, on the eve of the release, we wondered: how best to communicate these findings to the public in a way that would make them not only resonate, but be shared widely – and, dare we dream, maybe even go viral. CLF, like other nonprofits, has faced this problem before. We work very hard on long-term issues with diffuse risk and reward, and have taken to informing the public of our work primarily through words: we write blogs, press releases, and reports regularly – all the time competing for mindshare in an increasingly competitive, crowded, and noisy online environment. And so we decided to take a risk and try something we’d never done before: translate our findings into an infographic. Most of my colleagues are lawyers. They have a deep and abiding faith in the power of the written word. This was something new for all of us. The results were better than we ever anticipated. Once posted to Facebook, the infographic was shared, liked and commented on so many times it quickly became our most successful post ever – increasing our Facebook reach by more than a 7,000 percent after a week (and this before Facebook rewrote its definition of reach). In an effort to translate some of this into relationships, we created a landing page for the report. By requiring people to enter some of their basic information before downloading the report, we were able to track who was downloading the report and why. When combined with a traditional PR push, as well as a blog post and promotion across social media outlets (Twitter, Flickr, Pinterest, etc) that landing page has been very popular. Great words deserve great images: In the beginning was the word. But now there is word and image – at least if you want to give words a chance. Social media rewards graphics and imagery that simplify otherwise complex ideas. Words can’t be replaced for nuance and complexity and for those already initiated to a cause or issue. But for those on the peripheries looking in – the potential allies and supporters – imagery can be a far more powerful hook, especially in social media. Translate interest into relationships. Likes and shares are a nice affirmation – especially to those of us at nonprofit communications desks – but the case for impact is thin unless those likes and shares translate into more meaningful and lasting connections. Ben Carmichael is senior communications manager at CLF. Follow him on twitter at @bhcarmichael.